After graduating from medical school at the University of Michigan, Ann Arbor, in 1972, Dr. File received his Master of Science in medical microbiology from Ohio State University in Columbus, in 1977, where he also completed his fellowship in infectious diseases. Dr File is Vice President of the Board of Directors of the Infectious Diseases Society of America (IDSA) and Past President of the National Foundation for Infectious Diseases (NFID). 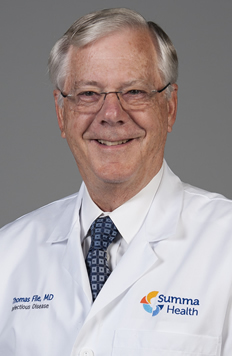 He is a Master of the American College of Physicians, a fellow of the American College of Chest Physicians, and a member of the American Thoracic Society. He is a past Chairperson of the Standards and Practice Guidelines Committee of the IDSA and served as a member of several guideline panels. He is a past-president of the Infectious Disease Society of Ohio. Primary research interests that Dr File has pursued include respiratory tract infections, immunizations in adults, antimicrobial stewardship, and evaluation of new antimicrobial agents. A frequent lecturer nationally and internationally, he has published more than 250 articles, abstracts, and textbook chapters, focusing on the diagnosis, etiology, and treatment of infectious diseases, especially on respiratory tract infections and antimicrobial stewardship. He received the Watanakunakorn Clinician Award from the IDSA in 2013 and the John P Utz Leadership award from NFID in May 2017. He authors sections on community-acquired pneumonia, acute bronchitis, and hospital-acquired pneumonia in UpToDate. He is Editor-in-Chief of Infectious Diseases in Clinical Practice.